The 12.9″ iPad Pro is a great productivity device, but unfortunately it ships with an inadequate 12W power adapter. This is the same charger commonly used with the smaller 9.7″ iPad line, and it’s much inadequate for a device as large and as power hungry as the 12.9″ iPad Pro. I find that when using the iPad Pro at full brightness, it’s difficult to maintain your current charge, let alone gain battery life, when using the 12W charger. I’ve actually seen my iPad Pro lose battery life even when it was plugged in. Needless to say, it’s pretty obvious that Apple should have included a beefier charger with the 12.9″ iPad Pro. Thankfully, as was revealed at this week’s iPhone SE event, an adequate solution is now here. If you’re an iPad Pro owner, should you invest in Apple’s new 29W capable USB-C to Lightning Cable? Is the USB-C to Lightning Cable + USB-C Power Adapter worth it? Let me just preface this by saying that this test is by no means scientific, but it’s super-obvious that this new charging solution is much better for the 12.9″ iPad Pro. The difference is night and day. To test, I simply let the iPad Pro drain until it shut off and displayed the “charge me” message when attempting to turn it back on. I then plugged in the USB-C to Lightning cable and let it charge and automatically power on. I enabled Airplane mode for this test to make sure that no background network activity occurred. For the first 10 minutes I set the screen brightness to maximum levels. For the next 10 minutes, I let the iPad Pro charge with minimum screen brightness. After the 20 minutes were up, I noted the final charge level. I then repeated this same test with the Lightning cable and 12W adapter that shipped with the iPad Pro. With screen brightness set to maximum, the 29W adapter was able to charge the iPad Pro, albeit a bit slowly. Ultimately, it reached almost 15% in 20 minutes of charging. With screen brightness set to maximum, the 12W adapter could basically only hold the current charge. When using the iPad Pro with screen brightness set to max, I’ve seen the iPad Pro actually lose charge, even when connected to the 12W power source. As mentioned, this is not a scientific test in a controlled environment, but it really doesn’t take such a test to see that the USB-C to Lightning Cable plus the USB-C Power Adapter are must-have accessories for 12.9″ iPad Pro owners. In fact, I’d go as far to say that shipping the iPad Pro with the 12W charger was a mistake that results in a bad user experience. Watch our video walkthrough embedded above, and see for yourself. The USB-C to Lightning Cable is just what you would expect. On one end is a Lightning connector, but the opposite end features a USB-C connector instead of the standard USB Type-A connector that we’re all familiar with. Like Lightning connectors, USB-C connectors can be inserted on either side. 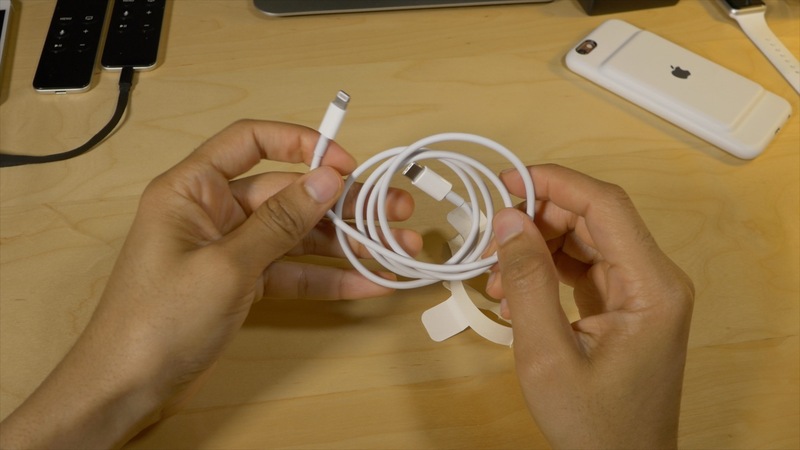 This means that, for the first time, we now have a charging cable that’s reversible on both ends. One of the nice things about the Lightning cable that ships with the iPad Pro is that it’s thicker and more robust than the Lightning cables that come with our iPhones. Well, the USB-C to Lightning cable features an even lower gauge — it’s noticeably thicker than the iPad Pro’s Lightning cable, and more robust at the connector ends as well. The USB-C Power Adapter is what really makes this whole setup work. 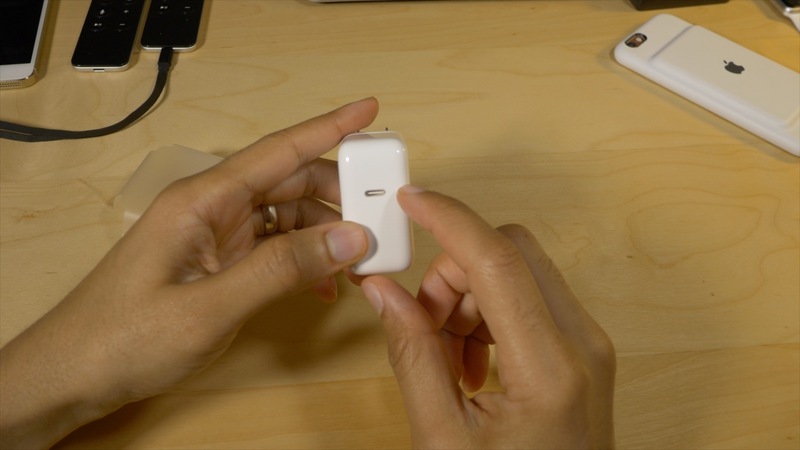 Unlike the adapter that ships with the iPad Pro, this adapter is slightly larger, features a USB-C connection, and is capable of providing 29W of power. Coincidently, the iPad Pro is capable of using all 29 watts, which makes this adapter a perfect fit for the largest tablet in the iPad family. To start with, the USB-C to Lightning Cable is a pricey investment. Not only will you have to pony up for either a 1-meter or 2-meter cable at $25.00 and $35.00 respectively, you’ll also need to buy Apple’s $49.00 USB-C Power Adapter. After using the 1-meter USB-C to Lightning Cable, I have to recommend going with the 2-meter version, as it’s the same length of the Lightning cable that ships with the iPad Pro. If you’re a 12″ MacBook owner, the good news is that you can use your MacBook’s USB-C Power Adapter to charge the iPad Pro. That means that you’ll only need to invest in a USB-C to Lightning Cable. If you don’t own a 12″ MacBook, you’re going to spend either $74 or $84 just to get started. It’s not a cheap investment, which makes the fact that Apple didn’t include an adequate charging solution with the iPad Pro sting a bit. True, this whole setup can be a pricey investment, but the difference it provides when charging the iPad Pro makes it worth it in my opinion. What are your thoughts on the matter?